Rachel wants nothing more than to be a great soccer player, and she works hard to improve her skills, practicing almost every day with her two best friends. But she has one little secret she’s been hiding, and now she can’t keep it to herself any longer. She has scoliosis, and it’s progressed to the point that she needs to wear a back brace 23 hours a day. How will she play soccer? And what will her friends say? Will they even be her friend after they find out? And what about the other kids at school? Rachel deals with a lot of emotional and physical pain as she goes through her treatment. Her mother also had scoliosis and had to have surgery and she is worried Rachel will end up needing surgery too. Her father spends most of his time working. Rachel has to learn to communicate with her parents and her doctors to tell them what she needs and show them she is her own person with her own life and desires. Friends and boys are also a huge concern for Rachel. What if no one likes her because she has to wear her brace? Will they make fun of her because of how she looks? And most importantly, is she going to make the soccer team? This is a great book about relationships, communication, and standing up for yourself. The characters are well written and realistic, and there are plenty of emotional connections made. 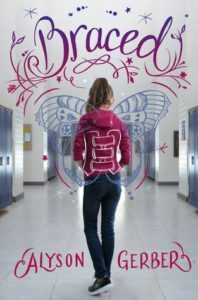 Rachel is a great main character, and readers of all ages can relate to some of what she is going through, but this is a perfect read for those ages 12-14.